This second chart does not sound right to me either: I have met East Asians that thought they were smarter then every-one, but I can't say that Asians are smarter. I sometimes think we are less educated in what it takes to survive in this modern world. overall. One needs to use brain to survive first and foremost ;is my thought. IQ itself is a skewed measurement, but speaking in generalities problem solving skills decline through atrophy if not exercised regularly. Hunter gatherers have to problem solve constantly to survive. Someone with a repetitive job and safe sources of shelter and food does not. Racial comparisons are polarizing and less than useful in general. I think that the way we measure IQ might be a problem. 1. You are problem solving in your daily life, only the problems are different since hunter gathering. 2. We have internet and computers that place facts at our fingertips. We can research anything fast. 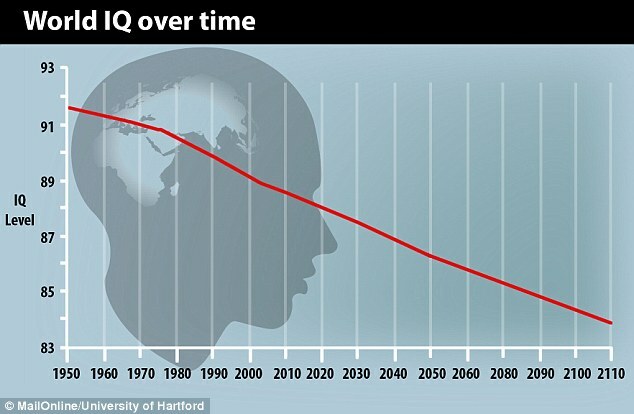 The chart is saying that average IQ in 1950 was higher then now. 1940 was WW2, it was devastating to Europe. How is it possible that IQ is higher 1950 then now ? Russia, China, US, EU, Canada all have literacy rates over 95%. I mean global literacy has increased in 100 years, so how is it possible that we are dumber? I don't think you will find your answer. If they tested for iq during those times their baseline was likely different so the results are going to be skewed. As for the "race" and IQ graph, I'd be highly suspicious of both the data and any conclusions one might want to draw. 1) About how long does it take the Earth to rotate on its axis? 2) About how long does it take the moon to revolve around the Earth? 3) About how long does it take for the Earth to revolve around the sun? 4) Is it always dark on the far side of the moon? I'd say that people today are dumber about traditional knowledge topics (astronomy, mathematics, etc. ), but damn, they can tell you all you ever wanted to know about Hollywood celebrities, TV shows, movies, etc. But you have good point.